Ellis Park Stadium, also known because of its sponsorship by The Coca-Cola Company as Coca-Cola Park. The large stadium was the country's most modern when it was upgraded in 1982 to accommodate almost 60,000 people. 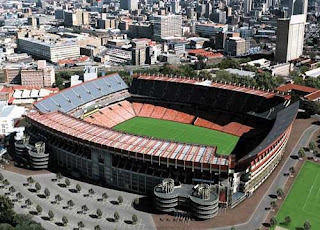 Ellis Park Stadium will host five group games, one second round game and one quarter-final of the FIFA World Cup 2010, for which its capacity will be increased by 5,000 seats on the northern side only, to 65,000. Areas like the Presidential suite are already receiving a facelift. There will also be a hospitality room and new changing rooms. The total cost of renovations was R500 million and were complete in June 2008, two years before the 2010 FIFA World Cup.